Machinedrum, otherwise known as Travis Stewart, is an excellent producer who just released a new 15 track album, Human Energy. He is having a lot of fun visiting friends and showcasing his palette of new music, currently touring to support his release. I caught up with Travis to talk about his new direction, collaborations, and tour so far, before his show in Montreal for Red Bull Music Academy's Turbo Crunk party. He recently moved to California to help inspire his musical drive, a symbolic transition of change at the time. Living in Los Angeles helped him share ideas with similar artists and built creative energy. The past few years have seen a more mechanical side of his music from living in big cities like New York to Berlin. Travis explains the technical side of how his musical instrumentation. "A lot of it had to do with having a new setup in my studio. I bought a 88key fully weighted mini controller. I've gotten back into using the piano as a source of inspiration. In the past I was reliant on using software synths and samples. I'm inspired by the original music that interested me at an early age, which is songs on the piano." While in New York, he started to experiment with more melodic music and major chord progressions. Instead of writing the melancholic transposed minor chords that he's known for, which is labelled his "safety zone", Travis is trying something new. Writing bright and cheerful major chord bass music has been a huge challenge. Machinedrum's aim is it make music sound intense, aggressive and positive. There is some recorded guitar on Human Energy, but in terms of the orchestral sounds Travis uses samples. Ableton is primarily what he uses to make music, drawing from their sound banks when necessary. One special song that sticks out off his the latest release is "Spectrum Sequence". It almost makes a syntheses of colours and sounds, moving through the colour spectrum with different synth patterns. I wanted to know how the track came about, since it is so unique. Travis explains how he started with an idea on the piano. He came up with a chord progression that tried something with new time signatures. A vocal feature would unite the whole song. Upon reflection Travis realized the total amount of chords matched the same number of ROYGBIV, which gave him the idea. My next inquiry goes into the artists he worked with over Human Energy and how he felt about working with friends. "I wanted to work with my friends, I have personal connections to everybody featured on the album. I didn't want to reach out to anyone I didn't know already, so having those relations were really important to me. Working with my talented friends instead of having to sample all the time was a nice thing to get back into." Part of making an album is a natural feeling and he only wanted collaborators who also wanted to help. There should be positive intention when working with friends, instead of paying some ridiculous fee. Sometimes you'll hear collaborations on big feature albums, which shows clear financial ties. Travis explains how it's easy to see through that facade and didn't want to front with his own album. Machinedrum has a lot of experience in the past collaborating with other musicians, such as making multiple mixtapes with Theophilus London. He also has collaborated with Azealia Banks, Jesse Boykin |||, Rochelle Jordan, Kevin Hussein and other vocalists of importance to his career. There has been a big change between Machinedrum's techno style on Vapour City to the vibrance he brings on Human Energy. His discography is a natural extension of Machinedrum's life, showcasing his emotions and experiences over the years of production. Everyday this year he would wake up and try to make a new song, which is an admirable ambition.
" I had to consciously not play shows in order to put in that attention to finish the album. I wanted to create a world for the music in a cohesive sonic palette." So far on his tour he's having a good experience, remarking on Berghain in Berlin. In the past he lived in the German capital for three years, learning to let his music breath. One can easily go out and hear amazing techno, which heavily influenced Travis on Vapour City. Similarities can be seen letting the ideas grow over time. 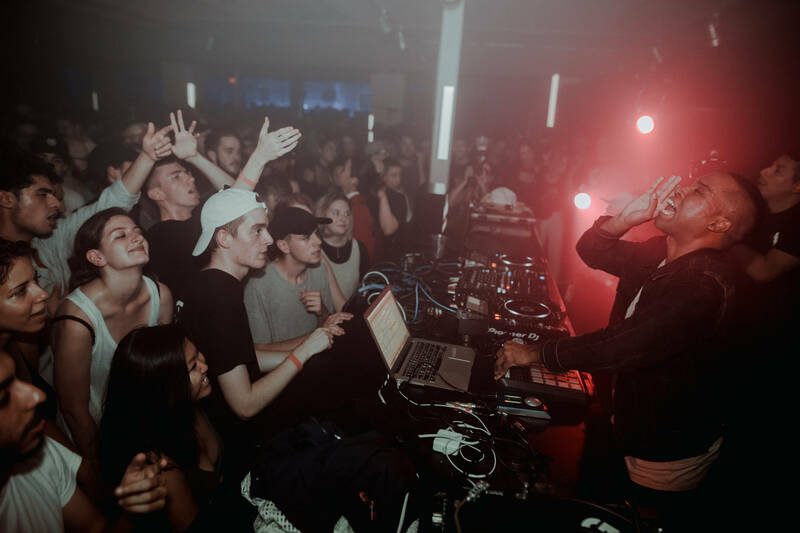 Travis is well known friends of Jacques Greene, Lunice, and Ango, sharing a special bond with the Montreal scene. He explains to me how much respect he has for the artists, since they used to book him to play when his career was starting. Travis was present for some of the original Turbo Crunk parties, which were hosted in 2006 to 2009. The party scene has taken off beyond its original limits shaping a new style of syrupy bass sounds. 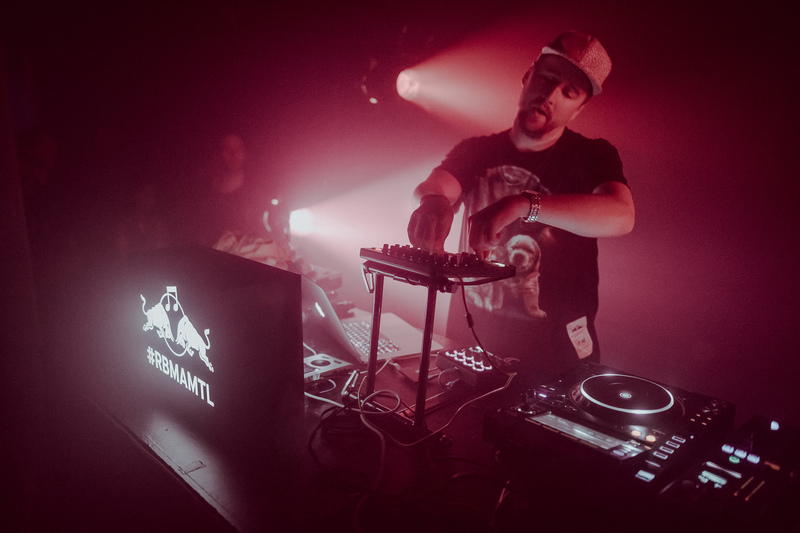 Red Bull Music Academy's Turbo Crunk reunion went beyond any expectations. Machinedrum played an energetic set full of his new music that the crowded embraced. Lunice came on next with an onslaught of hip hop records and banging tracks for the dance floor. Clams Casino closed the night with a fire mix, starting with his production pieces then moving into his original beats. You can catch Machinedrum coming up on tour at these cities around America, Australia, and New Zealand. Travis explains how he was in New Zealand for NYE before, which you can stream below.